How to Make Pumpkin Muffins from Canned or Fresh Pumpkin - in EASY illustrated steps! or a 50:50 mix of sugar and sweetener. Tip: to cut calories, you can substitute 1/2 cup of applesauce and 1/2 cup vegetable oil in place of the 1 cup of oil. 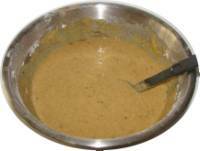 I n a large mixing bowl, stir together the flour, soda, salt, cinnamon, allspice, nutmeg and sugar (or Splenda). Bake approximately 15 minutes at 350 F (175 C). The test for doneness is the knife test: when a clean knife can be stuck in and removed cleanly. Then take out of pans to let cool on a rack. Like banana bread, pumpkin muffins taste better if you wrap them in plastic wrap (Saran wrap, cling film), refrigerate it and wait until the following day to eat them. They keep well in the refrigerator and can be frozen. 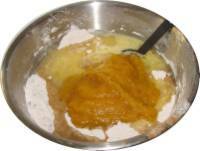 A visitor writes on October 03, 2010: "I tried your pumpkin muffins recipe using a fresh sugar pumpkin that I roasted at 350 degrees wrapped in foil for an hour. This is without a doubt one of the most moist breads I've ever had. I made the recipe into five, 3x5 loaves to share with friends and people are already begging for more! Thanks so much for this website! " 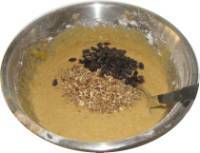 A visitor writes on November 12, 2008: "I just wanted to let you know that I made the pumpkin muffins with the directions from your website, including the instructions for making my own pumpkin and it turned out fantastic. Thank you very much for the recipe." 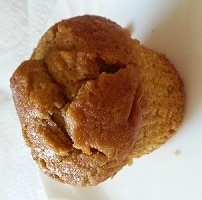 A visitor writes on January 26, 2015: "I am just writing to say that I have used your homemade pumpkin muffin recipe with fresh cooked pumpkin and they are simply amazing. I,of course, add the additional items (raisins and nuts). I plan on using your recipe for homemade pumpkin pie as well. No doubt it will be equally as delicious. " 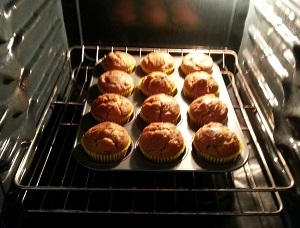 A visitor writes on October 04, 2013: "I have used this pumpkin-muffin-from-scratch recipe of your for years. My family practically begs me to make it year round. To facilitate these requests; I use a rather large pumpkin and just freeze in 4 loaf servings (big family). Thanks a ton, your website is awesome! Sincerely, J.D."